There is no evidence that Wigeon has ever bred in the wild in Cheshire and Wirral, and the records in this Atlas survey were typical of those in many other years. Single birds were present in the breeding season at a number of sites, with some waters holding several birds. Of course, any sighting of a lone male duck in the breeding season should be followed up in case he has a nesting female hidden away, but none of them gave any hint of that. This vegetarian species is the wildfowlers’ favourite, and a few summering Wigeons over the years are birds with ‘pricked’ wings, unable to fly well enough to migrate. Four tetrads had records of pairs in suitable breeding habitat, including birds displaying at Inner Marsh Farm (SJ37B), all counting as ‘probable breeding’, but nowhere has a nest ever been found or chicks seen. This story is typical of most counties in Britain. 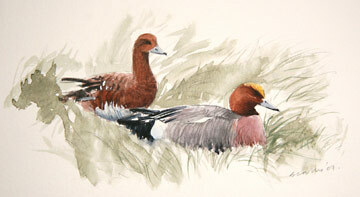 Wigeon is a scarce enough breeding bird for its fortunes to be monitored by the Rare Breeding Birds Panel, and their report for 2004 shows that birds were summering in many counties, and pairs often present, but there were only 20 pairs confirmed breeding in England, in Essex (1 pair), Northumberland (4 pairs) and Yorkshire (15 pairs) (Holling et al 2007).